Increase your website's potential with a trust mark. Learn how to increase transactions on your site and decrease shopping cart abandonment when you read this white paper. 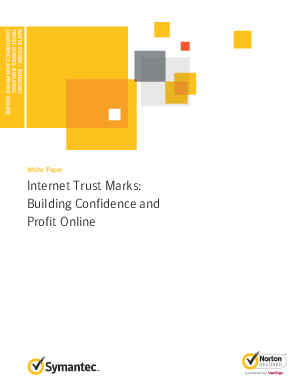 Download this paper and you will learn just how beneficial trust marks are to online businesses. The fear of fraud, spoofing, phishing, identity theft, and lax website security have a sizeable percentage of consumers wary of using credit cards online. According to the 2011 Norton Cybercrime Report, cyberfears are on the rise - nearly three quarters of adults (74 percent) say that the possibility of cybercrime is something they are always aware of when online and nearly 9 in 10 adults say it's important that their security software protects their computer 100 percent of the time. However, having the right website security solution in place is not enough by itself to turn the tide. Online merchants need to advertise their investments in website security and the commitment to their customer's protection. As proven time and again, trust marks are one of the best ways to convey the notion of site security and establish peace of mind with would-be consumers.